C.K. Pralahad and Gary Hamel define core competencies as those capabilities that differentiate a business from its competitors – the things that make it unique and give it a competitive advantage. But how does this translate into employees’ competencies? Part 1 of this blog post series examines the difference between organizational and employee core competencies, and how many organizations have struggled to implement core competencies in a strategic and impactful way. Core competencies can add much value to an organization when identified and implemented correctly. Pralahad and Hamel provide numerous examples of successful companies from the 1980s that succeeded in leveraging their competencies and forecasted the demise of others. Let’s start by first debunking some myths of core competencies. Some organizations have fallen into the trap of choosing core competencies merely because they are common among all roles in their organizations. For example, many service organizations choose client service since almost every role in their organization is customer facing. However, this could easily fail the 3 tests. Couldn’t everyone in your market say the same thing since you are operating in the same line of business? While finding common strengths in your organization is a good step in identifying core competencies, they should be evaluated to see if they are really a core competency. 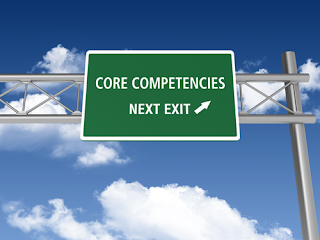 We need to move from the original definition of core competencies. Yes, identifying what your organizational strengths are is one good strategy. However, you could select your core competencies to be more forward thinking. For example, you could select core competencies because these are the ones that are your organization’s greatest flaws and need to be developed. Think of the slogan that Avis recently scrapped after 50 years “We try harder.” which demonstrated the company’s focus at continuous improvement due to their number two position in their market. Core competencies might not yet be strengths, but could be something that you do differently (and presumably better) than everyone else in your market space. For profit businesses do not have the market cornered on core competencies. The three rules can easily be applied to a not-for-profit or government context. Organizations of all sizes try and expand their market whether it is accessing new grants, signing up new members or reaching new citizens. Every organization also has some form of product. It might be a service, a campaign or a message, but every organization produces something, otherwise it would fail to survive. Likewise every organization has a competitor whether they are competing for funding sources, listeners or ‘customer share’, we are all competing against another organization whether directly or indirectly. An organization cannot have a limitless list of competencies. Pralahad and Hamel recommend 5-8 core competencies. I recommend maximum of 3 to 4 core organizational competencies. Similarly, you should be able to isolate 3 to 4 core employee competencies that are fundamental to achieving the organizational competencies. (You might have core employee competencies mapped to more than one core organizational competency). The fewer the competencies, the easier it is to apply them throughout the organization. I find that organizations that have a more limited set of competencies can focus better on what is important to their clients. Going back to recent business history, it is clearly evident that this statement is not true. Those organizations that have not adapted to the business climate, changing consumer desires and new competitors will be, and have been, left behind. This has been demonstrated in spades during the 2008 / 2009 world-wide economic downturn. Organizations should set up a process to review its core competencies on a regular basis (I would recommend to align it with the business planning cycle) to determine if they are continuing to pass the three tests. Core competencies are individual to your organization. Now is not the time to use boilerplate competencies or search the web for some good definitions. The competencies and their definitions must come from your organization and your people. Take the time to write them well, and get everyone involved in the process. Researching comparable organizations and competency dictionaries are a great place to start, but if you truly want to mobilize your team, you must use language that speaks to your organization or, even better, comes from your team members themselves. Let’s get to the glass half full part of this article since all is not lost. I would suggest that if you are ready to define core competencies or improve the ones you have, then you are going to have to start with a clean slate. It is a large commitment but I already warned you I don’t believe in quick-fix management snake-oil. If you need to dust off the plaque on your wall to know what these are, take the time to rewrite them first. Strong core competencies come from a clear perspective of where you plan to go. If you have written value statements you should also review those now. You might find that these are replaced by your new core competencies. I would recommend this replacement since they are often similar and folks will tend to get confused between the two. It seems simple and trivial, but do you really understand what your organization does, how it does it and who does what? Leaders can use multiple tools to complete this step. Perhaps you will send out a questionnaire to all of your staff asking for input on what they feel makes your organization special. You might complete a thorough job analysis of all of your roles to better understand what everyone does. You could complete a full competitive analysis of all of your products. Do whatever you need to do to know more. Doodle, draw, brainstorm, meet, survey. The methods are endless and some will be more appropriate to your organization than others. Remember these are competencies that are unique to your organization and meet Pralahad and Hamel’s three tests. If necessary, do web research, compare yourself against your competitors, talk to your clients, and consult your partners and distributors. Sometimes it is hard to see your core organizational competencies, except through other people’s eyes. You will also want the right people around the table at this step. Perhaps you will have a town hall to gather everyone’s feedback, or you will have a facilitated meeting with your senior leaders. Your approach depends on what is right for you. Once you have identified your core organizational competencies it then becomes possible to identify the core employee competencies that will drive your organization down the road to success. Again, this will involve leaders, key clients / customers, and others that understand what it takes to deliver on the organization’s identified core organizational competencies. An easy way to fail is to only have 3 heads defining the core competencies for the whole organization. Especially if you are in a people-driven business, you should receive feedback from every employee impacted by these core competencies. As with the previous step, you might want to go outside your organization and hear from clients or end users. Regardless, get feedback and incorporate it into your final version. The next easiest way to fail is to leave your core competencies in a binder on a shelf to collect dust or hide them in a dark corner of your company website. Take every opportunity to get the word out on the new competencies and how they can be used in your organization; publish them, use them in daily business life, put posters up on the wall. I once encountered an organization that had safety as a core competency. Every meeting began with a safety tip, even those with contractors in the corporate office far from their production facilities. Spending a lot of time here is critical to ensuring that your competencies endure and actually provide you with some value. Your core competencies must be integrated into your regular business practices to actually make a difference. This might mean including them in everyone’s performance evaluations, reorganizing a production line or having clients more involved in a planning process. Set measurable objectives for your core competency implementation and report back on your progress to everyone in your organization. The more employees that are accountable the better chance that actual change can occur. Finally, if you complete this process in a week, you haven’t done your job right. Expect a full core competency implementation (core organizational or employee competencies) to take months to fully come to fruition, especially if you are completing all of the work in-house. If you’re unsure of your abilities, invest in some consulting assistance. A consultant will often have a more objective view and be able to pick up on issues and ideas that are hard identify as an insider. They are also likely to have many tools and techniques that will streamline the process. After all, if you are going to use resources to develop core competencies anyhow, you might as well make sure you engage help that can get you to the end goal faster and help you avoid common pitfalls. HRSG is a leader in Competency Development and Competency-based Talent Management. Contact us today to find out how we can help you.